Tuesday afternoon saw Ol' Myrt and her 11-year-old grandson at The Generation Networks offices in Provo, Utah for an appointment with Product Development Manager David Graham. My grandson is currently editing the video interview, but here are some highlights of what's coming down the pike at Ancestry.com's website. Record based - a record you both have attached to an ancestor. Tree based - you have likely matches on your uploaded family trees. Activity based - you and another member have completed a shoebox save, combined ancestors in family tree files, updated info on a common ancestor, etc. This new MEMBER CONNECT interface will eventually allow you to collaborate with another researcher, and combine information. You can have multiple items for birth, marriage and death, so if your common ancestor's birth date conflicts with info on the other Ancestry.com's member tree, you can keep both sets of birth info, until you determine which is correct. 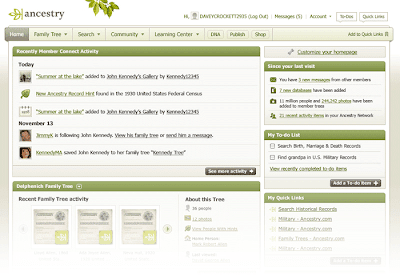 Rather than receiving an email notice, any new MEMBER CONNECT information will be collected and presented on your Ancestry.com "landing" page when you login. This is very much like RSS feeds of blogs that go to your iGoogle or Bloglines page. The information is there when you go to the website to view them. BELOW note what the page will look like if you are viewing a census record, and decide to leave a comment about the image. 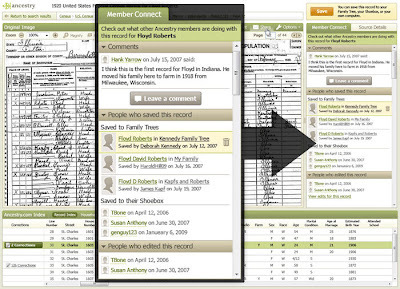 The soon-to-be released MEMBER CONNECT interface will list other Ancestry.com members who commented on the document, attached it to an ancestors in their online tree or saved it to their shoebox. It is likely you'll want to communicate with those other Ancestry.com members to coordinate research efforts. Ancestry.com provides security of communication based on your choice of privacy levels. 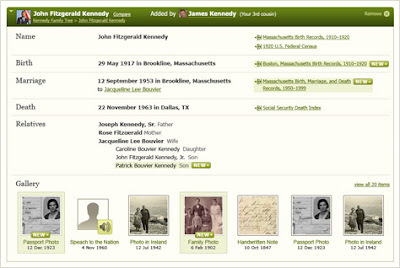 BELOW is a sample page of how an individual ancestor's page will look, with the green text on the far right indicating a "new" link to another Ancestry.com member’s research. This provides the opportunity for collaboration to share additional research and avoid errors or duplication of effort.